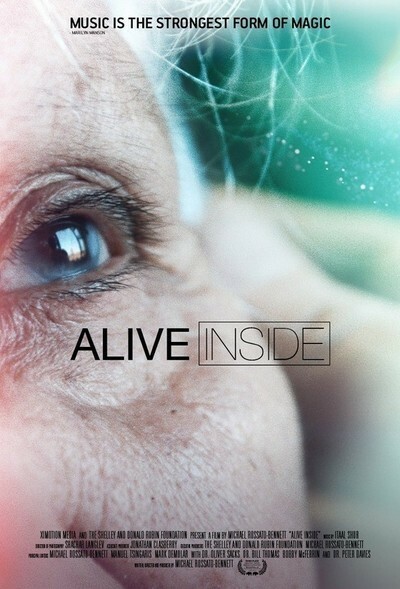 "Alive Inside," directed by Michael Rossato-Bennett, is a passionate documentary with a lot of valuable information to impart, and a laudable humanist agenda to push. Unfortunately, it’s also not a particularly good movie. In fact, at certain points it can be an actively annoying one. The subject is how music can awaken the minds of people suffering from dementia and/or Alzheimer’s disease (the movie also chronicles, briefly, the music therapy undergone by an MS sufferer). It shows patients reacting to exposure to what had been their favorite music in a different time in their lives, and this footage, although it arguably infantilizes the individuals depicted, also depicts impressive results. The movie goes on to indict the American healthcare system/industry, which, apparently, is more interested in pushing costly pharmaceutical treatments than any kind of therapeutic model. As a result, souls, hearts, and lives are receding when maybe they don’t have to be. Pertinent well-known experts make their views known. Neurologist Oliver Sacks, the author of a book on the effects of music on the brain, offers solid science; musician Bobby McFerrin is an articulate proponent of those qualities of music that can’t be scientifically quantified. They’re illuminating. Mr. Rossato-Bennett, alas, is less engaging, and he’s the most insistent voice in the film. Crafting the movie as a work of activism, he’s pretty much the anti-Nicolas-Philibert, whose films such as "In The Land Of The Deaf" immersed viewers in a different state of being. He frames the experience of the patients through his own lens explicitly from the very start, stating in his narration of working with physician and music therapy pioneer Dan Cohen, “What unfolded that first day moved me so much…” that he had to etcetera, etcetera. The narration (“We went looking for answers”) and off-screen questions (“You like the music you’re hearing? Tell me about the music”) are insistently pushy and intrusive throughout—and the visual approach is a greeting-card one, at best. A filmmaker who’s always telling us what we ought to be feeling is usually one who cannot actually evoke feeling. And so it is here. The Sacks and McFerrin mini-episodes start coming off as sweet relief as Rossato-Bennett starts laying on the faux-"Koyaanisqatsi" slow-and-fast motion shots, and things reach a particularly eye-rolling level near the end, when the movie turns into an advertisement for itself, reprising a CNN segment in which the filmmaker and Cohen talk about a patient-reaction clip that went “viral” on social media. This is understandable as an activist tactic; I get that. But as a segment in a feature documentary targeting an audience of adults, it felt condescending in an especially unwholesome way. Whether or not this approach actually succeeds in getting changes made to the system, the subject, and the human subjects, deserve something a lot better than what this movie gives them. It doesn’t feel great to have to say that, but it’s the truth.